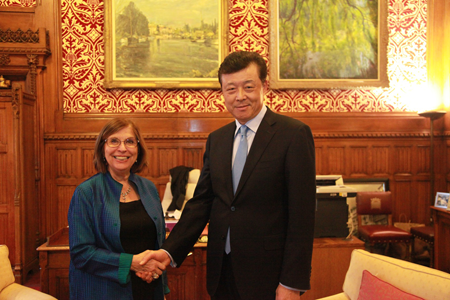 On 2 March, Ambassador Liu Xiaoming met with Lord Speaker of the House of Lords Baroness D'Souza in the British Parliament. They exchanged views on strengthening parliamentary exchanges between China and the UK. Ambassador Liu expressed appreciation to Baroness D'Souza for the importance she attached to the development of China-UK relations, and for the warm reception she had extended to President Xi Jinping during his state visit to the UK. Ambassador Liu said that China attaches great importance to the parliamentary exchanges with the UK. The two countries could further strengthen the current exchange mechanisms, increase the level of exchange and expand fields of cooperation, so as to build stronger China-UK ties in the "Golden Era". The Lord Speaker reviewed President Xi's historic visits to the British Parliament, and gave her full endorsement to the global comprehensive strategic partnership for the 21st century between China and the UK. She expressed her readiness to further promote parliamentary exchanges between the two countries, to enhance mutual understanding and cooperation, and to make positive contribution to China-UK relations in the "Golden Era".